male pattern boldness: Peter Models (Belatedly) the Striped Knit Rugby Shirt! Peter Models (Belatedly) the Striped Knit Rugby Shirt! Now that fall is here and, with it, cooler days, I finally found a weather-appropriate day to model my striped knit rugby shirt which, you may or may not recall, I completed late last summer. 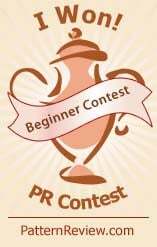 You can view it today by clicking here. 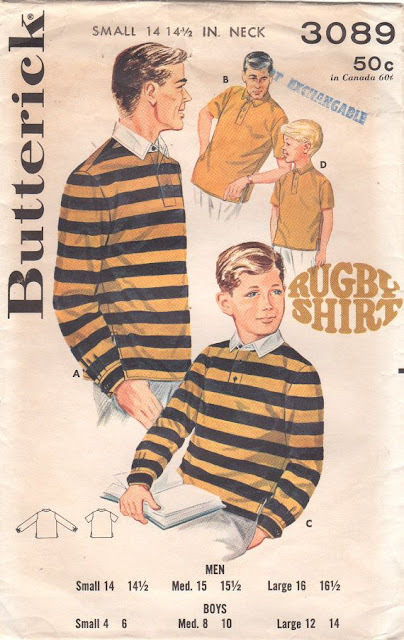 Rugby shirts are one of those garments that never really go out of style, though they definitely had a higher profile here in the States during the mid-Seventies/Eighties preppy craze -- remember The Official Preppy Handbook? Anyway, I think mine, which is a bit of a variation on the classic style pictured up top, is a great addition to my wardrobe -- easy to wear and flatteringly trim cut. I'll admit it: I know absolutely nothing about rugby. 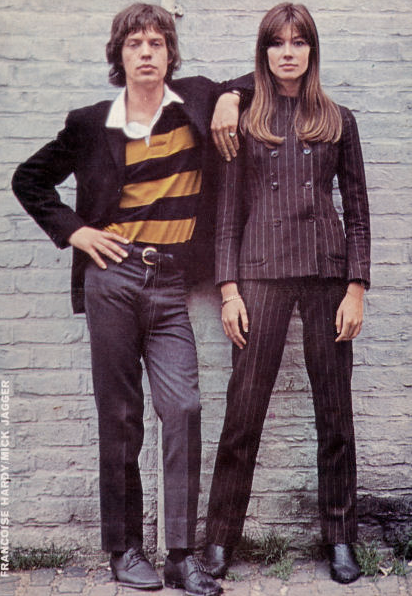 But throw on a blue blazer and stand next to a French music/style icon like Francoise Hardy, and anything's possible. As always, a terrific shirt. Perfect for fall. It looks fantastic, and even better on you. Knits seem so nebulous, eager to go their own way, and plain intimidating, but you certainly stopped the stretch at every seam. Perhaps it's time for a knit dress for a certain model we haven't seen in quite a while? Hmmm??? It looks great on you. I especially love it worn with the blue jacket - very nice combination. Peter: You are GORGEOUS in this shirt. It's so elegant, even in its casualness. You remind me of Stanley Tucci (which is never a bad thing). Rugby shirts (like the one I wore at school - playing horrid rugby) are made of thick woven cotton and the sleeves are just hemmed. I like your addition of shirt cuffs. Oh boy, this shirt brings back memories for me. I love rugby shirts and used to made some for my son whe he was about 5 years old. He's now 38. 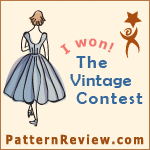 My pattern of choice was from the Stretch and Sew company. Loved their patterns. Great job on your rugby shirt! New Fabric, New Books, and MORE! Laura Mae Comes Over to Play! What I've Been Sewing, et al. My New Paisley Shirt -- from 1942!